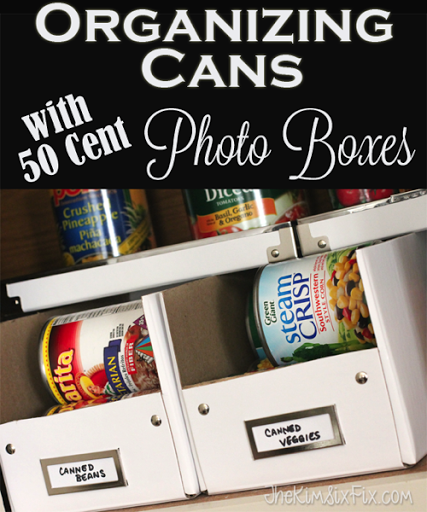 Organizing the Cans in Your Pantry for less than 50 Cents! Today I’m going to share an easy hack for organizing all the canned items you have in your pantry. This post is brought to you on behalf of the Cans Get You Cooking campaign. As a compensated Canbassador for the program, my goal is to share the benefits of keeping a well stocked (and well organized) ‘cantry’ on hand, in order to make it easier to create creative and easy homemade meals. The supplies for this pantry makeover are simple: a couple set of Ikea Photo Boxes (Kassett is the type I used) which cost 99 cents for a set of two! The boxes are ‘assemble it yourself’ which make them perfect for a quick hack to create can storage racks. The idea is that you want to shorten one end of the box so that you get a 'dispenser' style setup with easy access to get the cans in and out. Punch two holes in those interior flaps.. This is where the grommets will go through the side of the box and secure the outside flaps forming the new shorter box end. Now all you need to do is complete the assembly by folding the outside flap over..
And there you have it. A photo shortage box turned can dispenser! I used it to sort my cans by type within the pantry. It is now easy to take them in and out, and find everything at a glance: Having a large assortment of canned items in your pantry; from pastas, to sauces, veggies and fruit.. even baking supplies liked canned milks, means that you are ALWAYS prepared. Canned foods can be the hallmark of a healthy diet and are on par with frozen and even fresh foods nutritionally. But you need to be able to find them when you need them! And so as not to waste ANY space I used the tops of the boxes to form a second ‘shelf’ above the dispensers. This has doubled my total storage space on the shelf without things needed to be stacked and constantly falling over. Now it will be so much easier to restock my canned food stash knowing what I do already have on hand. I hope I have inspired you to organize your “Cantry” !